Curio.House is designed to engage the homeowner in living comfortably and efficiently. The house is now a residence in a community that supports low-income and formerly homeless families. 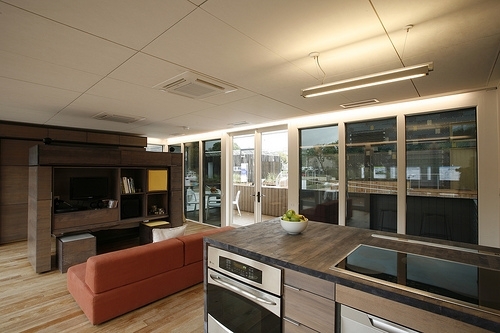 With its energy-efficient and cost-cutting features, Team Boston’s U.S. Department of Energy Solar Decathlon entry, Curio.House, piqued the interest of Housing Assistance Corp. This charitable organization, which delivers housing and services to the Cape Cod community with a minimal impact on natural resources, purchased the house for $150,000. After the competition, Curio.House left the National Mall on the backs of three tractor trailers. It traveled 450 miles to Bourne, Massachusetts, and was stored in its temporary home—a climate-controlled warehouse—until November 2010. Once permitting was complete, the house became the first residence in Community Green, a 46-acre project that offers formerly homeless and lower-income families a place to live, learn, and work in an environmentally sustainable setting. In 2011, Becca Wolfson and her boyfriend Billy Traverse became the permanent residents of Curio.House. Curio.House remains open to students and the public for tours and continues to be monitored for performance. Team Boston, composed of students from Boston Architectural College and Tufts University, designed Curio.House to stimulate homeowners’ curiosity about how well-designed homes can help save energy, money, and the health of the planet. It incorporated sustainable building practices such as passive solar design and daylighting to reduce energy, and it added a solar thermal water system designed to work in cold Northeastern winters. It also developed a monitoring system so future homeowners could adjust their energy use for maximum utility savings and minimum environmental impacts.